BANGKOK: Two Thai men were charged on Thursday (Jul 13) after an Australian tourist plunged to his death while parasailing on the tourist island of Phuket, the latest tragedy to highlight the kingdom's dismal safety record. 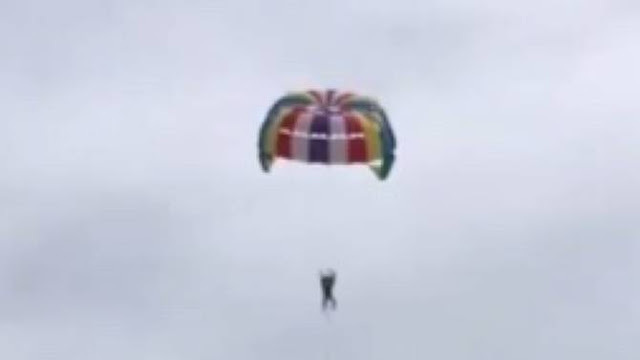 Roger Hussey fell while parasailing after accidentally pulling a hook that released his harness. People watched in horror on Wednesday as 71-year-old Roger Hussey fell more than 30m into shallow waters on Kata beach after the harness attaching him to the parasailing instructor failed. His wife, Thai national Budsabong Thongsangka, was filming at the time and uploaded the tragic video of his last moments onto the internet. Police in Phuket confirmed two men had been charged. "Boat owner Montien Jandaeng, 45, and parachute attendant Rungroj Rakcheep, 38, are charged with negligence resulting in death of another person," Lieutenant Suwisit Keereerak, from Karon police station, told AFP on Thursday. "The equipment was not up to standard and the parachute attendant failed to tell his victim to hold the ropes in the correct position," he added, saying Hussey died in hospital.